The Yamaha YSL-882 Xeno Custom Series Bb/F Trombone features a heavy gauge brass and a thick-walled, one-piece brazed bell that was previously hand-hammered thousands of times to achieve the best orchestral sound. The compact wrap F attachment produces rich tones and the whole instrument has a balance and evenness that you have to hear to believe. During the most delicate passages both powerful projection and subtle control can be gained from the flexible myriad tonal colours used on this instrument. The Xeno series draws together a map of craftsmanship that involves the design, advanced technology and the experience, talent and dreams of honoured artists from all over the world. The trombones in this series are here to inspire their players with the incredible power and projection that they produce. Together with their flexible myriad tonal colours these trombones produce powerful projection and subtle control, even through the most delicate of passages. Xeno trombones continue to develop towards their artists' needs in order to be the ideal musical instruments on the market. 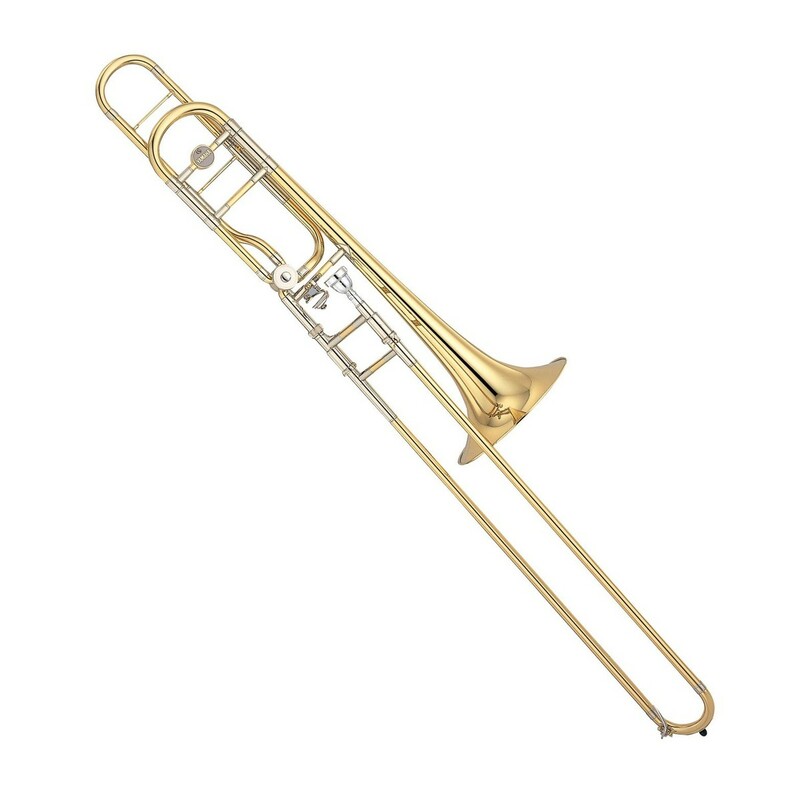 The one piece bell featured on this YSL-882 trombone helps the instrument to achieve a pure, and dominant tone. The bell has an axial seam that makes it a continuous addition of the instruments material allowing for these superior tones. The larger bell has been developed to perform a singing, colourful, open sound that also projects a solid core. Thanks to the narrow slide this trombone is able to produce a quicker sliding technique that will allow its player to manage the horn easier than they could previously. By excluding sharp turns in the crook the feel and response of the instrument will be opened. The YSL-882 features one of Yamaha's unique slide lock designs that helps to keep the lock in place whilst also stopping it from falling off. Yamaha have positioned perfectly rounded tubing on the instrument to help lessen turbulence and to create a smoother airflow. Yamaha worked hard to redesign their Xeno trombone case into a compact and contoured product. These changes have made the case more secure overall. The contoured shape enables your trombone to fit tightly into place whilst the interior holds it in and stops it from moving around during travel. The compact half of the design gives players a smaller case to carry to and from gigs and lessons. The Yamaha Xeno trombone doesn't come alone, in fact it includes a compact contoured case as well as a Yamaha Sullivan mouthpiece. Making this outfit the perfect all-in-one package to get you started. Use this instrument straight from the box with everything that you need included. Yamaha's standard series mouthpieces enable smooth attacks, secure control and easy playability. At the perfect weight balance for an all-round use this mouthpiece is the perfect addition to this outfit.